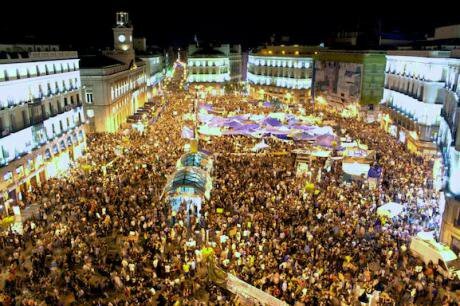 The Puerta del Sol in Madrid, shown here on 20 May 2011, became a focal point for the Spanish indignados movement. Wikimedia. Public domain. Antonis Galanopoulos: In your new book The Mask and the Flag that will be published in 2017, you argue that contemporary protests bear the mark of ‘citizenism’. What exactly is citizenism? In the past you have also referred to ‘anarcho-populism’. Is it the same concept? Paolo Gerbaudo: Citizenism, as I describe it in the book, is the ideology of the movements of 2011, of Occupy Wall Street, Indignados, Aganaktismenoi, of all these protests that despite their differences share common characteristics in their practices, their discourse, their vision. These movements tried to recuperate the populist idea that wasn’t present before in protest movements. It is a peculiar kind of populism; it’s not the kind of populism that we associate with the nineteenth century popular struggles or of Latin American populism. That’s why I describe it as citizenism; as the populism of the citizens. Instead they find an easier point of identification, the ‘citizen’ as the individual member of the people. References to ‘citizen’ rather than ‘the people’ allow for a more pluralist, more diversity-oriented kind of populism. Using references to the citizen also implies that citizens are self-organised. Usually we find in the discourse of these movements this idea of self-organised citizenry by coming together in the squares, in the new agoras. By the very act of assembling, people are able to construct this self-organization that ultimately leads them to construct a popular power. These are the different dimensions that describe citizenism, used analytically to describe a different type of a populist discourse that doesn’t necessarily go through the mediation of a charismatic leader. I use the term citizenism alternatively to the term anarcho-populism because practically it is the same term. Citizenism is anarcho-populism precisely because of the fact that it renounces, it eliminates the need for a charismatic leader as a point of unity and identification for popular movements. These movements in fact combine motives that come from populism and anarchism. Populism and anarchism are two ideologies that are closely related. Bakunin, the most influential thinker of anarchism, was heavily influenced by the populist narodnik movement in Russia. The anarchist movement in the beginning of the twentieth century had more of a populist idea than people often assume in terms of mobilizing the entire society, not just the class. How do you explain the rise of right wing populism? Why does the Right and not the Left lead the populist resistance to neoliberalism and seems to be winning the battle for hegemony? The Right is now reaping the benefits of its own failures. It was the Right that initiated and mainstreamed neoliberalism; that introduced neoliberalism as a political agenda. Now it is people who until recently were neoliberals that are the first ones to reject neoliberalism, and precisely the countries that first embraced neoliberalism now refuse it, namely the USA and the UK; they are the first ones that are making a move beyond it, but from a conservative viewpoint. We are approaching what can be described as a post-neoliberal horizon, in which a number of ideas from the neoliberal era are questioned. This doesn’t mean that it is a post-capitalist one. We may even move towards a worse type of capitalism than neoliberalism ever was, more exploitative, more authoritarian and more dangerous for international relations. It is the Right that wins the battle for hegemony first because the Left, even its radical ranks, adopted a very problematic globalist view that while it internalized many liberal values, it did not account for people’s desires for control at the local and national level. The inability to deal with sovereignty and the national question is a pathology of the Left. People like Isaiah Berlin, himself a liberal thinker, have noticed that fascism was the product of the Left’s inability to understand the nation. It was the result of the Left’s inability to conceive the nation’s solidarity, the kind of naivety that was ultimately ridiculed in the First World War. We are in a similar conjuncture today. The inability of the Left to understand why there is this resurgence of national sentiments and how it is rooted in the failure of globalization to deliver its own promises is why the Right has the upper hand in this discourse. The Right can also identify enemies that are more palpable and imminently visible such as migrants and foreigners, rather than enemies that are more abstract. Lastly, it has to do with the stubbornness of the Left, the dogmatism of the Left; the Left is far slower to change and adapt to circumstances. Do you think that the articulation of a left-wing populism is the best solution in order to battle right-wing populism, or is it that populism per se is the enemy of democracy? Yes, I think that left-wing populism is the best response to right-wing populism. We need to engage with populism. Populism is a phenomenon that emerges in times of organic crisis. It is no surprise that it is in the ascendancy after the latest crisis of capitalism. This doesn’t mean that populism has all the solutions or that there are no problems with it. It is productive in certain circumstances and it is counter-productive in others. It is certainly productive for the Left in the current condition, since it allows the re-construction of a broader social base. I don’t see populism as surrendering to the logic of the radical Right, as many people in the Left see it. After all, most, if not all forms of successful left-wing politics were populist in form. The crisis highlighted the importance of the notion of ‘sovereignty,’ especially in Europe. Can a discourse about sovereignty really be articulated in a progressive way? I think that this is a difficult endeavour, but it can be done. Sovereignty is a polysemic concept. There are views of sovereignty originating in Thomas Hobbes, but there are also other, positive and more progressive views of sovereignty, such as the one of Rousseau, who speaks about sovereignty as popular sovereignty. What such views ultimately share is that sovereignty is the condition for the political. There is no political without sovereignty. There is no political power without defining a territory, a jurisdiction of authority in which it operates. This notion needs to be claimed if we want to have any power to act against a collapsing neoliberalism. It is a difficult battle but yet one that is ultimately about facing up to the conditions that we are in. You argued recently that there is no left-wing populism without progressive patriotism. What exactly is progressive patriotism? How do you understand the relationship between populism and patriotism? It’s not something that I invented. It’s already part of the discourses of Podemos and Syriza, making clear that those attitudes are not necessarily against the Left. Patriotism comes from the Roman term ‘patria’ which comes from ‘pater’ (meaning ‘father’), and refers to the land of your fathers. It’s not necessarily a national patriotism. It can be local patriotism or it can be regional patriotism. There can be no populism without a sense of a local, regional or national identity, a territorial identity. Alexis De Tocqueville has said that democracy in the United States was the product of patriotism; because of the sense of pride that people had, they cared so much about the community and wanted to get involved in politics. The same applies to politics nowadays. There can be no successful progressive politics if people are not proud and concerned about the community they came from. It doesn’t mean being dismissive about other communities. A sense of belonging is something that we need to reclaim as a progressive element. In fact this concept of patriotism is the best antidote to nationalism. We have witnessed the rise and the fall of various social movements during the last eight years of crisis. What do you think is missing from their strategy and causing their ostensible failure to achieve social change? All these movements that emerged did not meet their stated aims, but this was only to be expected, because social movements are not unions or parties. They can’t be judged in terms of their immediate consequences on the political system. But the resurgence of the Left in Spain and Greece is very much a product of these movements. What these movements did was to create a new imaginary, a new logic for the left, not necessarily securing immediate change, which these movements can hardly achieve due to their nature. What does the rise of new radical left parties, like Syriza and Podemos, and the emergence of various social movements during the past years tell us about the role of leadership? Can the horizontal and the vertical dimensions of politics be articulated together? Vertical and horizontal dimensions are not exclusive. We need to avoid the kind of simplifications and verbalizations of some dogmatic views of politics where people believe that it can be made completely horizontal. ‘Horizontal’ per se is an absolutist term pertinent only in the sphere of religion. The idea that horizontality can construct a completely equal space of participation is something that has nothing to do with the legacies of the political. I think that you can achieve a radical democracy with strong leaders. A leader can be the facilitator of a strong democracy because he can be recognized, people can identify with him and he can be used by a grassroots movement as a point of identification and pressure to make sure that their demands are maintained. In this populist scenario, what we are seeing is that these two things go together at the same time. A more horizontal development having to do with radical democracy practices and a vertical development having to do with the construction of new forms of charismatic leadership. These two things together point to a new organisational form that is characteristic of the post-2008 left parties. Internet, and especially social media, are a part of our everyday lives. In your opinion, how can we use social media and other digital platforms in order to promote progressive politics? Are they an essential part of the struggle or has their importance been overestimated? They are an essential part of the struggle because they are mass media by now; their outreach is quite remarkable. They form a space that popular movements and populist parties cannot ignore. Obviously these media are hostile to popular forces for a number of reasons: they are owned by the oligarchy (by large corporations), they pursue a commercial logic, they can be at odds with social movements and finally they can often be used as tools of surveillance by the state. But the upsides are more than the downsides. The issue is how you use them and what can be channelled through them. Social media will remain an important tool in the arsenals of social movements and populist parties, while at the same time there is also a need for the development of self-managed and popular co-operatively owned platforms. This interview was conducted in the occasion of the Workshop ‘Europe's new radical Left in times of crisis,’ hosted by the School of Political Sciences at the Aristotle University of Thessaloniki and supported by the Rosa Luxemburg Stiftung (Athens Office) in November 26-27, 2016. See other articles from the Workshop here.